The NFL scouting combine is an utterly useless event that exists for the sole purpose of maintaining the league's grip on the consciousness of the American sports fan as far into the offseason as possible. We only pay attention to it because we are told to pay attention to it. It's like the Valentine's Day of the sports calendar. The combine does serve one useful purpose, though, and that is to remind everyone that many NFL general managers are deeply stupid people. Teams want to know whether Manti Te'o is gay. They just want to know. Now you have a situation where you have a guy who was in a relationship with a fake girl who ended up being a real man, and the man has said to Dr. Phil that he was romantically in love with Manti Te'o, it just raises a lot of questions that the NFL at some point is going to have to deal with. Elephant in the room. Dilemma. These are words that are being used to describe the sexuality of a grown man by people who are supposed to be evaluating that man's ability to play football. 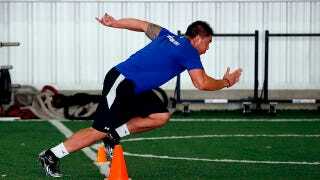 In other news today, Manti Te'o ran a 4.8 in the 40. John Harbaugh was not impressed.